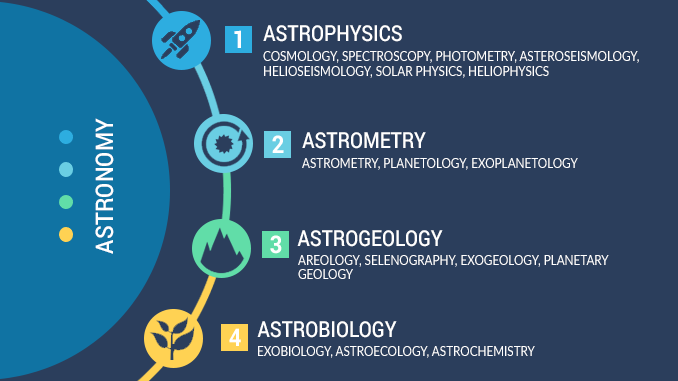 Studying our planet is such a vast topic because of all the branches of Earth Science. Earth science involves how the natural world interacts with its surroundings. Careers in environmental science are booming now. For example, we need geologists, biologists and geophysicists to better manage our ecosystems. 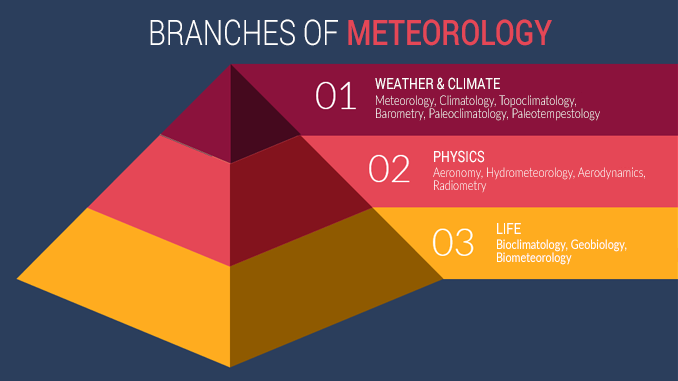 Because in order to define Earth Science and its interconnectedness, we need a complete list of Earth Science branches that encapsulates the topic in full. Well, look no further because we have brainstormed an outline of 123 branches of Earth Science. 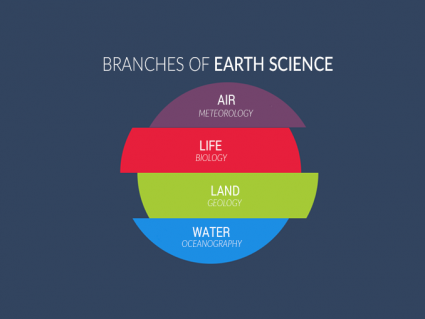 And each branch of Earth Science is placed where they fit best. Astronomy is the study of celestial objects and phenomena. It is the all-encompassing term that studies everything beyond Earth’s atmosphere. It applies the concepts from physics, biology and geology to explain their origin and evolution. Astrophysics applies the laws of physics to galaxies, stars, celestial bodies and the universe as a whole. For example, astrophysics examines the evolution and classification of galaxies, general relativity and the expanding universe. Cosmology studies ow the universe was created, evolves and its ultimate fate. For example, cosmology studies the origin of the universe from the Big Bang Theory and Phases as well as how it will evolve in the future. Spectroscopy applies the principles of light to understand matter. For instance, the universe is expanding because we measure the redshift of light. Redshift means that light stretches when objects move away from you. Alternatively, it’s blue shift when moving toward. Photometry gathers light within a range of wavelengths to determine the luminosity of astronomical objects. Once capturing photometric measurements of a celestial object, astronomers can measure the physical properties including temperature, chemical composition or distance. 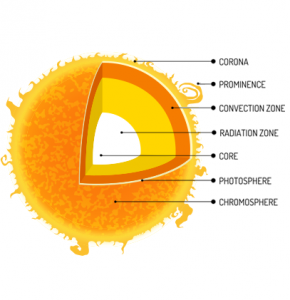 Heliophysics studies how the sun’s radiation affects its surroundings in space including “space weather”. For example, when the sun ejects a “coronal mass ejections”, this outflow in solar wind can disturb satellites, communication and GPS systems on Earth. Helioseismology examines the interior structure, composition and dynamics of our sun by observing waves from its surface. Like notes from a musical instrument, helioseismologists listen to solar oscillations and variations in brightness as a whole. Astroseismology observes oscillations from stars to investigate their internal structure and composition. For example, astroseismologists detect the gentle pulsations and measure periodic brightness change in stars. Like the geography of outer space, astrometry is concerned with how celestial bodies are positioned and move in space. By taking images of the sky, astrometry uses parallax and geometry to determine distance and stellar motion. How planets form in the solar systems including their composition and dynamics in history. Tied closely to planetary geology, it also studies the physical features of planets, moons and condensed matter. How many and where planets exist outside our solar system. The main focus of exoplanetology is inventorying planets and potential residences for new life outside our solar system. How geology relates to celestial bodies like moons, asteroids, meteorites and comets. For examples, astrogeologists examine rocks, terrain and material from celestial bodies in space such as from the Mars Rover. How geology is composed on Mars. 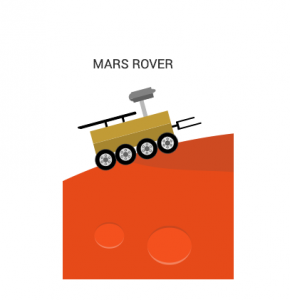 When the Mars Rover started wheeling around the red planet, its crosshairs were targeting the rocks and geology of Mars. Specifically, it was getting a close-up of the composition or areology of Mars. How physical features on the moon formed. For example, selenography understands and catalogs features such as lunar maria, craters and mountain ranges on the moon. How geology relates to celestial bodies like moons, asteroids, meteorites and comets. Similar to astrogeology, its focus is on how geology relates to celestial bodies like moons, asteroids, meteorites and comets. How life (including extraterrestrials) in the universe evolved, originated and what will be its fate. Astrobiology involves the search for life outside Earth including the environments that could support it. 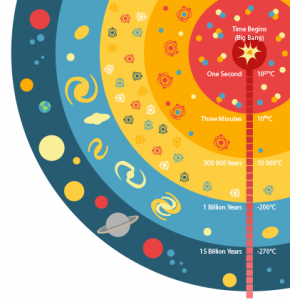 How likely and where is life in space. If you want to measure the probability of life in space, exobiology considers planetary conditions (biological/environmental) that serve to advance the evolution of life. How to study substances in celestial bodies, stars and interstellar space. For instance, astrobiology pulls from astrochemistry to better understand substances in celestial bodies, stars and interstellar space. By observing molecules in space, it gives a solid indication to the physical conditions to what we are used to on present day Earth. Geology is the study and science of how Earth’s landforms were created, have changed over time and how they will evolve. Whether it’s fossils, magnetic fields or types of landforms, geology is concerned with reconstructing the past. How layering of rocks and strata are analyzed to measure geologic time. Stratigraphy is also concerned with the layering of archaeological remains and their position on layers of rock. How organisms evolve and their interactions in their environment by studying fossil records often found in rocks. How microfossils are characterized. Paleo is short for “paleolithic” which often refers to the geologic past. How to reconstruct previous magnetic fields in rocks including the direction and intensity to explore pole reversals in different time periods (past and future). How landforms, physical features and geological structures on Earth were created and evolved. How geologic sediments and rocks are used to infer past earthquakes. How sedimentary and volcanic sequences are dated by geophysically correlating samples of strata deposited with the Earth’s magnetic field polarity. In a nutshell, this is the field of study that studies magnetic fields in rocks and past pole reversals. How Earth’s crust evolves through time contributing to mountain building, old core continents (cratons) and earthquakes/volcanoes. This field applies the underlying principles of plate tectonics to seismology, volcanoes, earthquakes and other geological events. How and where volcanoes and related phenomena (lava, magma) erupt and form (past and present). As tectonics play a key role in volcanoes, volcanology describes the types of volcanoes on Earth and their associated risk for impacting the biosphere. How seismic waves travel through and around the Earth from earthquakes. We use seismic tomography from earthquakes to see inside our planet and create 3D models of the surrounding layers of Earth’s core. How Earth’s crust deforms and has moved in recent and current time. How Earth’s crust and mantle deforms specific to its physical processes. Moreover, the field of tectonophysics targets the physical process that act on the behavior of waves. How earthquakes, active tectonics and individual faults are related to seismic activity. 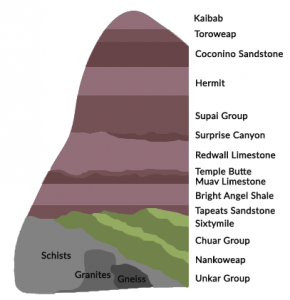 How types of rocks (igneous, metamorphic, and sedimentary petrology) form in their specific environment. For example, petrology uses mineralogy and rock types to understand geological formations from drilling. In addition, they study the chemical properties and how atoms are arranged. How chemical and crystalline structures in minerals are composed. How natural and artificial gems are identified and evaluated. How atoms are arranged and bonded in crystalline solids. How soils relate as a natural resource including their formation factors, classification, physical, chemical and fertility properties. Engineering fields consider soils as regolith. But for agriculture production, soils are considered a natural resource. How soils are classified based on their biological, physical and chemical properties. How soils influence plant growth and living things. How the field of agriculture involves science such as crop production, biotechnology and soil science. How groundwater is transported and is distributed in the soil, rock and Earth’s crust. Hydrogeology specializes in anything from surface-groundwater interactions, direction of flow for groundwater and measuring depths to the water table. How fruits and nuts grow and are cultivated. Pomology is loosely tied to horticulture, agronomy and agrology with a focus on producing successful crops. How sand, silt and clay are deposited and the processes that act on it. By understanding erosion, movement and deposition of sediments, sedimentologists support search for oil reserves and contaminated sites in mining, petroleum and research. How surface sediment (till, gravel, sand, clay, etc) overlying bedrock was formed such as during glacial retreat or in lakes associated in these periods. How ice and glacial deposits have reconstructed landforms as well as how existing (polar) glaciers behave and are distributed. Also, this field of study understands glacial movement including isostatic rebound. How physical processes and properties relate to Earth and its surrounding space. Geophysicists conduct surveys to explore what’s happening beneath our feet. For example, this includes anything from searching the ground for new sources of energy or the internal structure of Earth. How the intact, solid rock beneath surficial sediments formed including age (stratigraphic sequences), morphology and rock properties (folds, faults, fractures). How topographic relief in mountains are distributed in nature. The main focus is orography which studies topographic relief and how mountains are distributed. In addition, it’s concerned with plate tectonics which is a focal point for mountain building events. How physical features (natural and artificial) are arranged on the landscape. We use topography in climate models, air and water flow, land formations and to better understand past tectonic activity. How height and depth of physical features are measured land from mean sea level. Hypsometry maps the terrain and processes that act on it. For example, geologists use hypsometry to understand the profile of Earth and landscape evolution. How life and living organisms are structured, distributed, originated, evolved and functions. Biology works with time, disease, ecosystems and even extraterrestrials. It also works in different scales. 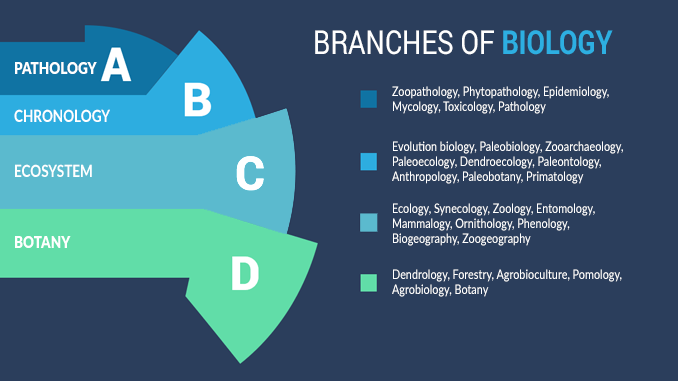 From individual atoms to the entire biosphere, biology has a wide range of career options. How disease spread, interacts and is prevented with animals. How disease spread and are managed for plants. How disease and determinants of health are transferred and distributed in populations. At a large scale, epidemiologists model disease outbreak with the goal to prevent its spread. How fungi are studied including chemical, physical and taxonomical properties. How living organisms are affected, treated and diagnosed by poisonous substances. Often, toxicology deals with how individual organisms are affected, treated and diagnosed by poisonous substances. It’s common to test in a laboratory the various substances and materials. How living things change over time and how life originated. How prehistoric life and fossils were composed specific to a geologic time scale. How organisms interact in environments over a geologic time scale. How multicellular animal fossils are used to reconstruct prehistoric environments. How animal remains are used to explore interactions between people, animals and environment. How primate behavior evolved often linking human and primate characteristics. How plant fossils can reconstruct past environments in geologic time. How tree rings are used to investigate forest development, disturbance areas and environmental change. How humans and societies behave from past, present and future. How plant and animal fossils are used to trace life and investigate the origin of species. How organisms relate to each other in their physical environment including distribution and population dynamics. How specific groups of animal and plant species relate within a community. How animals evolve, are classified, interact and are distributed. How insects are classified and categorized. How mammals are characterized including anatomy, taxonomy and natural history. How bird species are distributed, behave and described with focus on conservation. How seasons and cyclical climate patterns influence plant and animal species. How ecosystems are distributed in geographic space. How animals are distributed in geographic space. How plants are classified, grow and are managed in nature. Botany is synonymous with plant science or phytology. How trees are managed, planted, conserved and cut down. How woody plants and tree species are identified. How plants are distributed in geographic space. How crop production can be improved through plant nutrition. The study of short and long-term weather/climate patterns including its physical processes and effects on the biosphere. How climate (long-term weather patterns) has varied in the past and how climate change will affect the future. – How atmosphere chemistry and physics relate to weather and climate patterns. How topographic relief influences local climate in the lower air layer. How atmospheric pressure is measured and relates to weather and climate. How prehistoric climates have changed in a geologic time scale. How tropical cyclones have changed in a geologic time scale. How chemical and physical properties are composed in the upper region of Earth and planets. How electromagnetic radiation in the atmosphere is observed and measured. How air circulates in the atmosphere. How water and energy are transferred between the land surface and atmosphere (hydrologic cycle). How Earth’s magnetic field changes at different time scales including pole reversals. How physical processes and properties relate to Earth and its surrounding space. How long-term climate patterns interacts and affects living things. How the biosphere relates to the lithosphere and atmosphere. How atmospheric conditions and short-term weather patterns impact living things. For example, it may examine photosynthesis in plants or evapotranspiration rates in different seasons. 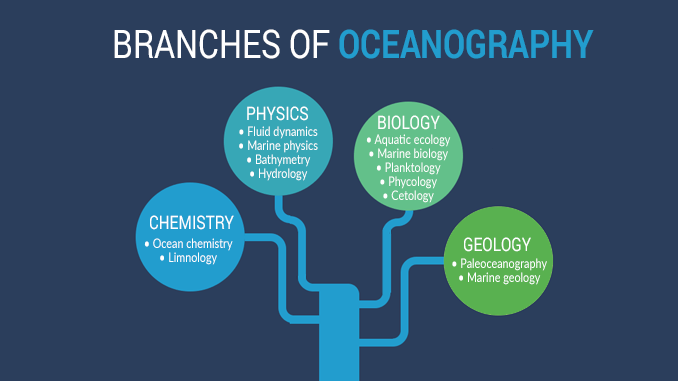 Oceanography deals with ocean chemistry, physics, geology and biology. Ocean chemistry or marine chemistry is a hot topic now. This is because climate change is happening from higher greenhouse gases into the atmosphere. About 80 to 90% of heat from global warming is going into our oceans. So the oceans are like a heat bucket absorbing 1000 times more heat than the atmosphere. As oceans become more acidic, ocean chemistry studies the chemical properties of oceans interact including marine ecosystems, ocean currents and fluid dynamics. How biological, chemical and physical properties of lakes and ponds relate (often) to their terrestrial surroundings. How chemical properties of oceans interact including marine ecosystems, ocean currents and fluid dynamics. How water travels in relation to land. How deep oceans, seas and lakes are relative to mean sea level. If you want to understand ocean depth, you’d perform a bathymetric survey with sonar instruments. How ocean currents circulate including water column structure and fluid dynamics. How liquids mechanically flow in relation to forces acting on them. How life in the oceans behave in their natural habitats. How aquatic life in water is distributed, interacts and grows. How fresh water (lakes, ponds, wetlands, etc) relate to flora, fauna, and environment. How fish species evolve and grow including taxonomy, anatomy and ecological importance. How algae are distributed, grow and are classified in aquatic ecosystems. How plankton drift in oceanic environment and contribute to carbon storage. How ocean history is reconstructed including how they circulated and evolved in the geologic past. How whales, dolphins, and porpoises evolve, behave and are distributed in nature. Ocean geology is the study of ocean landforms and how they will evolve. Earth Science is so hard to define because of all its “-ologies”, “-graphies” and “-ics” in Earth Science. 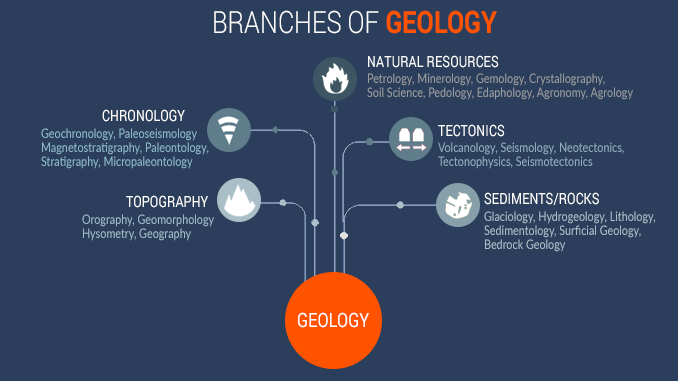 All of the branches of Earth Science are all woven together in fascinating ways. It’s the interconnectedness between all these ways to study the Earth us what makes it truly fascinating. Now that we have an outline of the branches of Earth Science, let’s dive into our journey into better understanding the planet we live in.